This article describes how to use the Jenkins continuous integration build server. Continuous integration is a process in which all development work is integrated as early as possible. The resulting artifacts are automatically created and tested. This process allows to identify errors as early as possible. Jenkins monitors the execution of the steps and allows to stop the process, if one of the steps fails. Jenkins can also send out notification in case of a build success or failure. Jenkins can be extended by additional plug-ins. For example, you can install plug-ins to support building and testing Android applications. For most platforms you have native packages, see the Jenkins Homepage. Jenkins provides Debian/Ubuntu packages which install Jenkins and register Jenkins as start service. See the Install Jenkins on Ubuntu description The Linux installation creates a /etc/init.d/jenkins script which starts Jenkins automatically at boot time. Jenkins stores all the settings, logs and build artifacts in its home directory. The default installation directory is /var/lib/jenkins under Ubuntu. Download the jenkins.war file from Jenkins Homepage. From this file you can start Jenkins directly via the command line with java -jar jenkins*.war. If the jenkins.war is deployed in your webapps directory, but cannot be started and the tomcat manager says ﻿FAIL - Application at context path /jenkins could not be started, you may need to grant the permissons for ﻿JENKINS_HOME. This makes the .jenkins folder writable and Jenkins can use it. You will need to copy the initial password from the file system of the server. Afterwards you can select to install plug-ins. Select the Inst#ce9178all suggested plug-ins to get a typical configuration. Create an admin user and press Save and Finish. Select Manage Jenkins and then Configure Global Security. Select the Enable security flag. The easiest way is to use Jenkins own user database. Create at least the user "Anonymous" with read access. 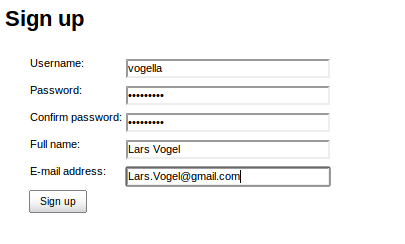 Also create entries for the users you want to add in the next step. 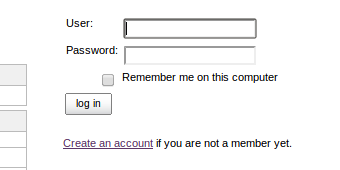 On the login page, select Create an account to create the users you just gave access. Go to Manage Jenkins, Manage and Assign Roles and then Assign Roles to grant the newly created user additional access rights. Navigate to Manage Roles to define access restrictions in detail. Pattern is a regex value of the job name. The following grants unregistered users read-only access to your build jobs that start with the C-MASTER or M-MASTER prefix and only those. If you want to access a private Git repo, for example at Github, you need to generate an ssh key-pair. Create a SSH key with the following command. The public key must be uploaded to the service you are using, e.g., Github. The build of a project is handled via _jobs_ in Jenkins. Afterwards, enter a name for the job and select _Freestyle Job_ and press btn:[OK]. Enter a description for the job and configure how many old jobs should be retained. Configure how the source code can be retrieved. If you for example using Git, enter the URL to the Git repository. If the repository is not public, you may also need to configure the credentials. Specify when and how your build should be triggered. The following example polls the Git repository every 15 min. It triggers a build, if something has changed in the repo. I typically delete the workspace before a build to avoid any side-effect. In the _Build_ section you can add a build step, e.g., a Maven build. Press btn:[Save] to finish the job definition. Press btn:[Build Now] on the job page to validate the job works as expected. After a while the job should go to green or blue (depending on your configuration), if successful. Click on the job and afterwards on _Console Output_ to see the log file. Here you can analyze the build errors. Jenkins pipelines help you align the build process of a project. This is done by specifying tasks and the order in which they are executed. There are all kinds of possible tasks that a jenkins pipeline can do for you. For example, build assets, send an email on error or send the build artifacts via SSH to your application server. Jenkins allows to specify pipelines using a `Jenkinsfile`. This is just a textfile that contains the necessary data for jenkins to execute the pipeline. It is called `Jenkinsfile` (notice: no file extension) and should be placed in the root of your project. NOTE: This file should be checked into version control as it is needed on your Jenkins instance. Jenkins supports two different syntaxes. For this tutorial we will focus on the declarative approach. <1> The `agent` directive tells jenkins to allocate a workspace and an executor for the pipeline. Without it, the pipeline is not valid and therefore required. The above process can also be done using the https://jenkins.io/projects/blueocean/[Blue Ocean] _Jenkins_ plugin. To install the plugin go to menu:Manage Jenkins[Manage Plugins>Available] and select the _Blue Ocean_ plugin. After the installation is finished you have an additional menu entry called btn:[Open Blue Ocean] in your main _Jenkins_ navigation. Click on btn:[New Pipeline] to create a new pipeline. Select your version control provider. Depending on your provider you will need to pass some kind of credentials. NOTE: Github provides the ability to generate access-tokens that applications can use to access the platform with your user. You can also restrict what the acess-token can do. The _Blue Ocean_ application will provide a link to the GitHub page you need visit. The necessary permissions that _Blue Ocean_ needs to operate are already selected. Add a description and click on btn:[Generate Token] at the bottom of the page. Copy the generated token and paste it in the _Blue Ocean_ mask. Select the account the repository belongs to and select the repository. If you already have a `Jenkinsfile` with pipelines in the repository it will show up in the last step. If not _Blue Ocean_ offers to create one for you. In the next screen you will see a visual representation of your pipeline. Here you can add or remove steps. To create a new stage click on btn:[+] in the canvas. A menu will open on the right that lets you specify a name and what steps you want to perform. After you have finished editing the pipeline _Blue Ocean_ offers to commit the newly created pipeline to your repository. Under the hood _Blue Ocean_ only created a valid `Jenkinsfile` for jenkins to use. After committing _Jenkins_ will build the project using the newly modified pipelines. Copyright (C) 2012-2018 vogella GmbH. Free use of the software examples is granted under the terms of the https://www.eclipse.org/legal/epl-2.0[Eclipse Public License 2.0]. This tutorial is published under the  http://creativecommons.org/licenses/by-nc-sa/3.0/de/deed.en[Creative Commons Attribution-NonCommercial-ShareAlike 3.0 Germany] license.